I think i killed quite lot of people with the tension. Heh. Another great extract from the Mai HiME anime, Ep19. 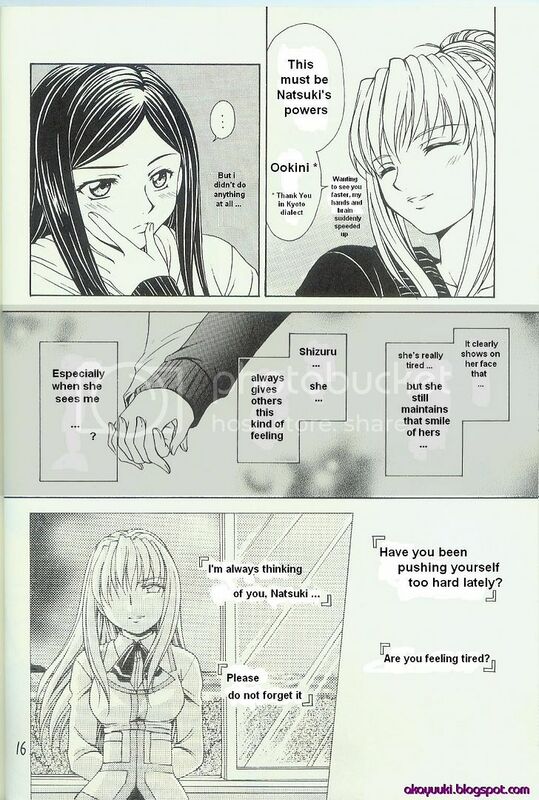 The scene where Shizuru told Natsuki that she will always be thinking of her and Natsuki thanking Shizuru for her concern and asking Shizuru not to come close to her heart. Awww. Manz, thunder ... I better switch off lappy in case there's blackout ... XD. I'll post Strawberry Panic! Ep5 tomorrow, i'm working on it now. Cya. PS: ARGHHHHHHHHHHHHHH! I think i wanna go watch the elections ... hm. Abt the hime festival, Natsuki thinks that maybe NOW, she felt that she felt the same way Shizuru had felt back then in the hime festival. In some way means that Natsuki might realize that she might be in love with Shizuru now. But she wasn't that sure yet, so when Shizuru suddenly zoomed in and wanted to kiss her, she panicked. But the main reason aint cos she's afraid of Shizuru anyways, don't worry haha.